Superconductors.ORG herein reports the discovery of a new family of copper chain superconductors that is an analog of the YBCO family. The above plot shows 5 Meissner transitions in the proto-compound TeBa3Cu4Ox. And all 5 are at higher temperatures than the Tc of YBCO (91K). The Meissner transitions in the above plot appear small due to incomplete sintering. Tellurium (IV) oxide melts at 733 C. So this compound had to be sintered at 720 C, which slows the chemical reaction to a crawl. After 200+ hours the color of the test pellet was still a greenish-grey, instead of the typical charcoal black. This means that the volume fraction of the desired phase was very low. 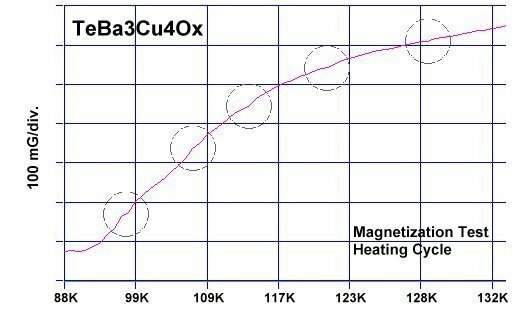 Nonetheless, enough Te134 formed to be confirmed by several magnetization tests. Those tests suggest that once a high-speed synthesis method is developed, TeBCO could be a serious market challenger to YBCO. The idea of substituting tellurium arose from prior superconductor discoveries that successfully incorporated tetravalent silicon into large unit cells with multiple insulating layers. 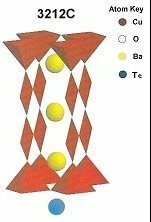 With an ionic radius midway between that of yttrium and calcium, and a +4 oxidation state, tetravalent tellurium was the most promising candidate to complement longer copper chains. The multiphasic nature of Te134 is a result of additional structures forming randomly within the bulk. The 2312C structure (above left) is the "stoichiometric" structure, producing a Tc near 98 Kelvin. So, based on higher-planar-weight-ratio-equals-higher-Tc, the below 4 structures are most likely producing the weaker transitions between 107K and 130K. But, whatever the mystery structures are, they buttress the net volume fraction of superconductive materials with Tc>98K. Synthesis of Te134 was by the solid state reaction method. Stoichiometric amounts of the below precursors were mixed, pelletized at 70,000 psi and sintered for 204 hours at 720 C. The pellet was then annealed for 10 hours at 500 C in flowing O2. Temperature was determined using an Omega type "T" thermocouple and precision OP77 DC amplifier. The magnetometer employed twin Honeywell SS94A1F Hall-effect sensors with a tandem sensitivity of 50 mv/Gauss.